Petroleum charge predictions are routinely used in the risking of exploration prospects. Migris has over the last 5 years developed new technology which aims to provide more accurate predictions. The Iterative Stochastic methodology applied to the charge modelling in Migri allows to test for thousands of combinations of the input parameters in the 3D models, thus giving a range of uncertainties for the prospects. The Migri Flowrisk and Phaserisk plots take the stochastic results and transform them into plots of probability of charge and risk of not finding liquids. The North Sea Charge study, which was completed in 2013, provided a calibrated charge model that we have used to make Flowrisk plots for important carriers in the area. Exploration for oil and gas in the Mid Jurassic reservoirs of this area has been very active since the completion of the study, and has therefore provided us with many wells to test the predictive capabilities of the modelling. Some of the results were presented at the 2016 Recent Advances in Exploration Technology. Using a very simple decision criteria of greater than 75% Flowrisk to predict a discovery in the Mid Jurassic reservoirs would predict the correct outcome in 14 out of 15 exploration wells that tested this unit. The Flowrisk of two yet not drilled wells were also published (Vikafjell N and Askja South East). Both wells showed Flowrisk values in the high 90s, well above the 75% criteria. It was therefore no great surprise that they both were discoveries, and this was highlighted in a news story in Geoforskning.no (in Norwegian). The map shows areas with high (green) and lower (yellow to brown colours) probabilities of flow. The table shows results from drilled exploration wells. Figure presented at the 2016 Recent Advances in Exploration Technology meeting and used in the Geoforskning.no news story (in Norwegian). The continuous drilling in the area has since resulted in the 31/7-1 Brasse oil and gas discovery (Flowrisk=99%), the 35/11-20B discovery of oil in Brent/Heather (Flowrisk=93%), the small 30/11-13 gas/condensate discovery (Flowrisk=87%), the 30/11-14 gas/condensate discovery (Flowrisk=92%), the 30/4-3S gas condensate discovery (Flowrisk=88%) and the dry 25/10-15S well (Flowrisk=44%). 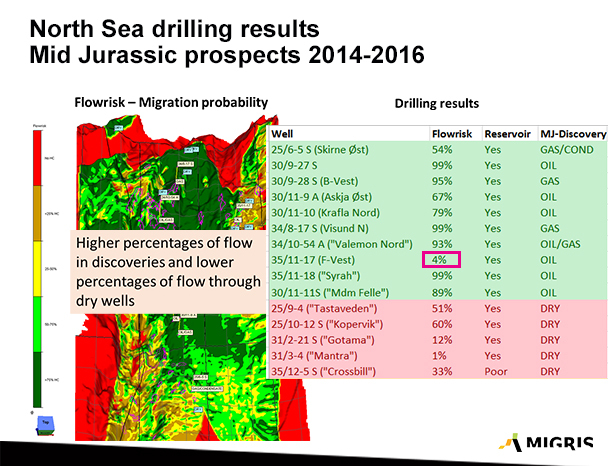 All the discovery wells that were drilled into the Mid Jurassic had Flowrisk estimates above the 75% criteria, while the only dry well was well below the same criteria. We are now quite confident about the Flowrisk prediction capabilities for the Middle Jurassic play in the Northern North Sea. The future will show if the predictions will be reliable also in other play types. Second generation predictions with even higher resolution models and using many more calibration wells are now in preparation. The first application that will be offered to the market is our update to the North Sea Charge study: the Utsira High Charge Atlas. The main objective of our new study is to make high-resolution predictions of probabilities for charge, phase and hydrocarbon trapping within the main carrier systems in the Greater Utsira High area. The study will also provide insights to understanding the overall hydrocarbon charge systems and underlying petroleum systems risks in the area. The resulting stochastic charge model has been calibrated against a database consisting of more than 500 hydrocarbon column observations (including dry wells) at different carrier levels. The detailed charge risk maps for the different carriers will be useful for highlighting prospective areas and to identify overlooked exploration targets. The maps will provide valuable input to e.g. farm-in evaluations and license application screening. The results may also be used as input to detailed charge modelling in a licensed area or prospect evaluation in combination with company data. For more details on the study, see the Utsira High Charge Atlas flyer. Examples of migration (left), Johan Sverdrup filling (middle) and Flowrisk map (right). The results from the study are available for purchase.